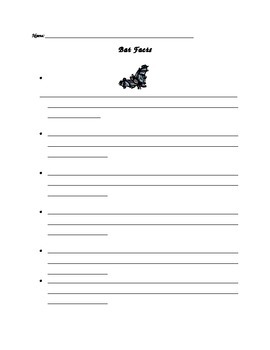 Then, I had the students write down 11 of the many facts we learned about bats. Then they formed an opinion of bats and chose 2 facts that supported their opinion. After, they wrote a paragraph on a bat template. Lastly, we colored and labeled the parts of a bat. Here you get the Fact and Opinion Sheets and Writing template. I used Bats are a Flying (a freebie on tpt) for part of my unit. I also used Bats Day and Night from Reading A-Z for part of my unit. In addition I used Bats-Poetry Packet (a tpt freebie).